Meet Florida Elago! 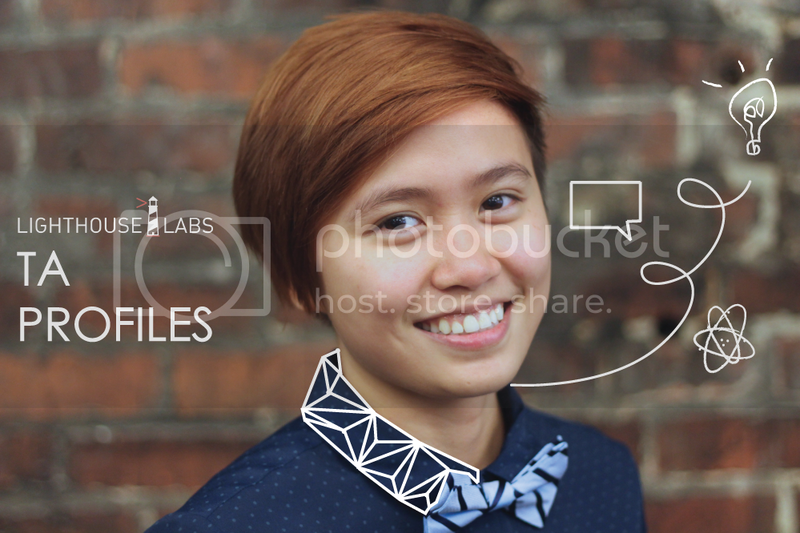 In addition to her role as a TA at Lighthouse Labs, she is also notorious for her intense bow tie collection. She lights up the brains of the students here through her work, she lights up the days of everyone with her surprise visits that usually include sticker sharing and cup art. Hey! What’s the deal? Who are you? I’m human-ish, half robot, half game console, I’m Florida. How’s it been being a TA at Lighthouse Labs? I find teaching to be really interesting because I never really learned programming in the way these students are. I basically learned code through experimenting. That must be super different. How’d you get started? You know, I just realized that I’ve been a part of this community since I was like 10 or 12. There was a really old forum type of social platform. I didn’t really realize back then, but we were actually a bunch of hackers who started putting in a bunch of scripts to export vulnerabilities. It was like Facebook where you have profile page and the scripts would essentially override certain things on the page. Did they ever catch on to what you were doing? Every once in a while they would fix the vulnerability that we were adding but by that point it became a thing. So other than trying to deface social platforms, what do you do outside of TA-ing? I work at Contractually and before that I worked at Shopify. To be honest, I still do a lot of programming outside of work. I’m going to be an "Intro To JS" instructor for Ladies Learning Code. But I also like rock climbing, I go bouldering. I like eating a lot. I like eating out so much, it’s a problem. I like going on MeatSpace. I like making open source contributions, I like giving talks. I think it’s sometimes easy for students who aren’t breathing and living code yet to feel a bit intimidated. I think a lot of new developers are afraid that they’re not good enough. There’s this thing called Imposter Syndrome where someone can go, “I’ve made all these things!” but at the same time also go, “I still don’t know if I’m a real developer yet”. But the truth is, even I still get that sometimes. How do you get over something like that? You always have to remember that you are not your code. Get over your ego. People who don’t really know much about being a developer usually have a certain stereotype towards it. What do you usually find that is? Haha, there’s a lot when you’re a woman developer. Like they expect you to hate guys because you’re really into tech or whatever. But let’s face it - the biggest stereotype of being a developer is that you are a 20 year old white male. So, you’re already breaking the stereotype just by being you. Pretty much. It’s really interesting because stereotypes source from the fact that human beings are really good at making judgements and grouping things together is what makes them able to make those judgements. Stereotypes is really our way of trying to make better calls in life, unfortunately stereotypes has an interesting cousin. His name is prejudice. How do we develop healthier spaces? The thing about Lighthouse Labs is that even though there are still more guys that are applying, the space is still has a diverse space in terms of attitudes. So what are some of the most recent things you've built? Any cool features or projects? The most awesome-est thing ever happened last week when I went to my old file sharing site and found all my image assets. What! So are you going to try to rebuild your old websites? I am rebuilding it for sure. I just have to sensor some parts because they’re super embarrassing. I was really young so some of that information is… well, it’s gross. Last thing: what’s the best part of teaching new devs? Teaching is really interesting because being able to understand the concept out loud is so different. When you’re trying to learn things by yourself, sometimes you don’t get the terminology. I see an “if statement” and I know this area is truth and that area is false but I had no idea how to explain it. Now I have the capability of being able to talk to a student and see it start to make real sense for them and that’s awesome.